The first building on campus since the City of San Diego Planning Commission unanimously approved the University of San Diego’s Master Plan is well on its way to completion. The Mission and Ministry Center, which includes a new multipurpose building in the east patio area of Founders Hall to create a home for Mission and Ministry offices and activities, is at 65 percent completion and construction is expected to finish on schedule by June 2019, said Facilities Management Senior Project Manager Tim Doudna. The Mission and Ministry project centralizes the department, for which Dillabough serves as its vice president. The project, which is a partial renovation of Founders Hall, will include both an interior courtyard and an exterior patio at the east side of Founders Hall. 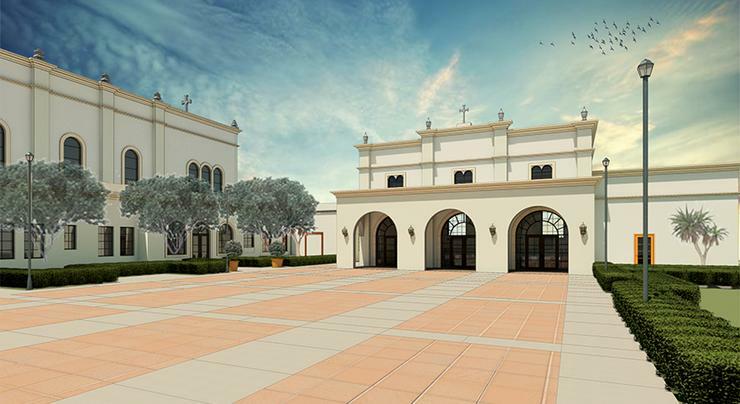 The architecture will blend in with the existing Spanish Renaissance style that defines USD architecture. Doudna and USD have worked on this 15,000 square-foot project along with Architects Mosher Drew Inc. and Dempsey Construction. Facilities Management invites the campus community to learn more about the Mission and Ministry project, including architecture renderings of what the inside spaces will eventually look like and photos and a project webcam with live streaming of the building’s progress, by visiting the featured projects page. The Mission and Ministry Center, located next to Founders Hall and Founders Chapel is on schedule to finish construction in June 2019.